Road Test of ThinkTank "My Second Brain Briefcase 15"
I'm on the road quite a bit and always travel with my laptop. I'm a bit particular about my bags, not that I'm a slave to fashion, but I am a "fit and function" fanatic. But heck, if it looks good too, all the better. I recently acquired the ThinkTank My Second Brain Briefcase 15 and took it on a few trips to test it out. I recently retired an old bag that served me pretty well, but it had a few things that I didn't particularly like, after living with it for some time. I didn't want another briefcase with a big flap that folds over the top. I know these are very popular, and they do a decent job of keeping confetti and other minuscule particles from falling in the bag, but they really aren't that ergonomic. I want quick and easy access to my most used items: reading glasses, earphones, pen, wallet, and my interstellar transponder confobulator. I don't want to lift a flap and then unzip another pocket to get to these. Silly, I know. Lots of pockets that make sense! Dedicated iPad pocket easily accessible from the front pocket, or store it internally in one of the other pockets. Dedicated fast access phone, wallet, or sunglass pocket on the top. Water bottle or accessory pockets on both ends of the bag. They cleverly zip closed when not in use. 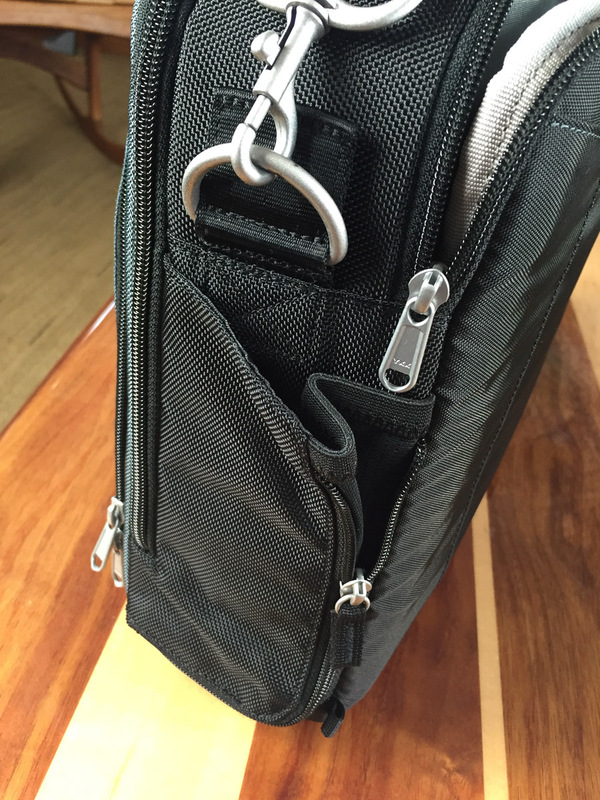 Very high quality hardware and YKK double zippers for fast, easy access and durability. The bag has structure so it stands up un-supported when set down. My old bag was floppy and would collapse flat on the floor if I didn't lean it up against something. I used this bag on recent out-of-town trips to do SPTV.me and creativeLIVE. I had to carry quite a bit of stuff and move through airports, cars, taxis, restaurants, and studios quickly and effectively. It got knocked around, scraped, rained on, and put to the test. I had to work in small spaces and be able to quickly find and access items when I was going live in 30 seconds and realized I'd forgotten something in my bag. Granted, I'll need a year of use to attest to its durability, but judging by the build and materials, I feel confident it will last as long as I do. It is comfortable to carry with a lot of weight in it – as I had my 15" Macbook, iPad, power adapters galore, cables, toy dragon, water bottle, etc. I really like having the laptop compartment separate and quickly accessible via the smooth zippers. I also like the dedicated iPad pocket on the front, giving me quick access on the airplane without having to pull the whole bag out and dig through it. Our personal every day carry bags can be very, well, personal. Everybody has their favorites, so I thought I'd share mine. ThinkTank makes some great gear and they also have a special going now if you purchase with this link: free gear with orders over $50. Do you have a favorite too? Double zippers everywhere and high quality materials make this bag a keeper. Both ends of the bag have zip pockets for umbrellas, water bottles, or similar sized items. I like that they zip closed when not used. You never know when you'll be caught in a thunderstorm or maybe just want to add a layer of security when sneaking through crowds. I really like having a separate zipper pocket for my laptop. It's quick and keeps my other junk in the main compartment. I think everyone should travel with a bottle like this with a built-in filter. Just the savings from not buying 2 or 3 hotel water bottles pays for it. This one is from Brita. On top there is a small, soft lined, pocket for your phone, wallet, glasses or other quick-need items. This holds a lot of stuff! Is the new Nikon D600 the perfect wedding camera? Is it perfect for anyone? How does it compare to the (nine-hundred buck more) Nikon D800? These questions, and the answer to "Can you give me a great, easy, Bloody Mary recipe?" will all be answered shortly! I recently got my hands on a D600 and decided to review and compare it to my own D800 and D3s. I partnered with my good buddy, Benjamin Edwards (author of the Nikon Creative Lighting System Digital Field Guide book, and an active wedding shooter) to test the cameras and see how they fare in real-world and controlled shooting environments. the slacker is back from Japan! I know, I've been remiss in posting here. I'm on a mission to make a regular date with myself to get things posted more often. It's so hard to keep up with everything, isn't it? I just returned from a great experience speaking in Tokyo for WPPI Asia. It the first time they had the convention there and it was quite a cultural adjustment for all the speakers involved. Speaking of speakers, I was honored by the company of Vicki Taufer, Jerry Ghionis, Clay Blackmore, Doug Gordon, Sandy Puc, and a handful of Japanese photographers who's names I'll avoid butchering. We all had a blast hanging out, playing with curious food items on our plates, singing badly to karaoke (except Jerry, who actually sounded good), and admiring the amazing Japanese culture. We were unamimous in our appreciation for the friendliness, helpfulness, and all around respectfulness of the Japanese. That's a lot of esses. While I've been to Japan several times before, for most of the others it was a first experience. On the first night there Jerry and his lovely wife, Georgina, took us all out to dinner and besides having a smashing good time, I spied Jerry's new point-n-shoot camera that he acquired while in Japan. It was the Ricoh GR III. He was really excited about it and I took a peak and got jazzed too. The next day I was the proud owner of one myself. This compact camera has a fixed 28mm f1.9 lens! At first I thought, "fixed lens?? ", but the allure of the 1.9 was just too much. The camera turned out to be amazing and I had more fun with this thing than I've had in a long time, with any camera. For the rest of the trip, this was the only camera I used. I found it refreshing, and challenging at times, to see the world through just one lens. It made me think a little harder about how to compose and capture without a longer focal length option. OK, I lied a little. I actually bought an even wider 21mm conversion lens that snaps on the front. 21mm in a point-n-shoot! It was awesome. The camera has every kind of automatic and manual control you can think of AND it is the most intuitively laid out camera I've ever used. It rivals my Nikon SLRs for features, and even surpases ANY other camera in some regards. The high ISO noise is really low - better than I've seen in any compact camera (although my Fuji F30 is still one of the most amazing in low noise and I'm going to do a side-by-side test soon). The camera can capture in JPG or RAW - using the common DNG format! Thank you Ricoh! It has in-camera HDR capabilities, Perspective correction, B&W + Toning, full control over color palettes, saveable custom setups, time lapse, and much more. Anyway, here are some images I took while in Japan. All are with the Ricoh with the normal 28mm or the add-on 21mm lens. Some were converted to B&W in-camera, others were worked in Lightroom. All were processed just in Lightroom using my Lightroom Presets. I loaded these to a .me gallery since there were a bunch. Click here to view all the images.